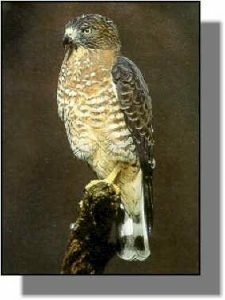 Comments: Broad-winged hawks are about the size of a stocky crow and have short, pointed wings. When seen in flight the underwings look white with a dark border on the trailing edge of the wing. The tail has broad black and white bands; the dark band at the end of the tail is wider than the other bands. It is probably the most abundant soaring hawk in North America. Distribution: Most of the broad-winged hawks seen in Kansas are migrants. During the peak of migration, sometimes thousands of broadwings cross over parts of Mexico and Central America in a single day. They winter in Central and South America except for a small number that stay in south Florida and coastal Texas There are only a few breeding records from Kansas, all from the eastern edge of the state. Food: Broad-winged hawks eat a variety of prey including insects, frogs, toads, salamanders and snakes. Small mammals and birds are also taken. Openings in the forest are important hunting areas where the hawks can watch for prey from a perch.